I love poke. Honestly, love. I crave it constantly – sometimes, even more than sushi. Perhaps it’s the nuttiness of toasted sesame oil. 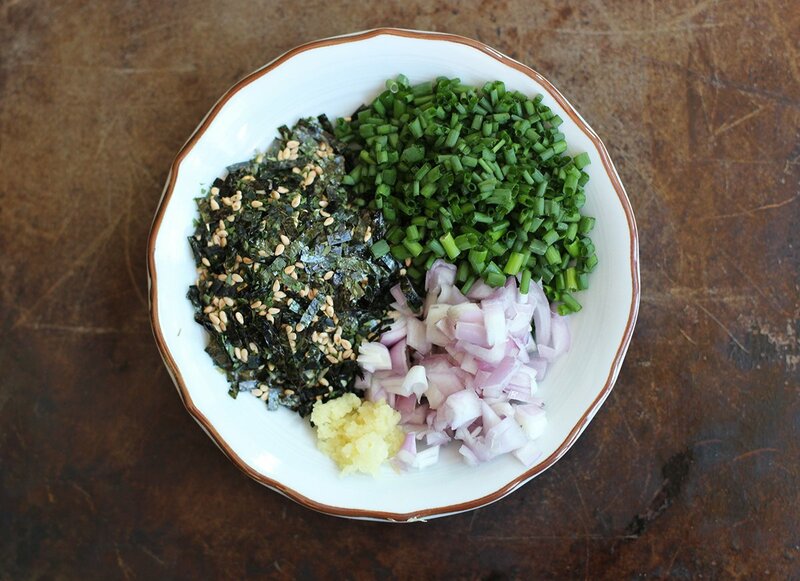 Or the sweetness of furikake. Nevertheless, it’s the perfect cool and healthy summertime meal and nothing beats making your own. You can control the heat, saltiness and sweetness to your liking. 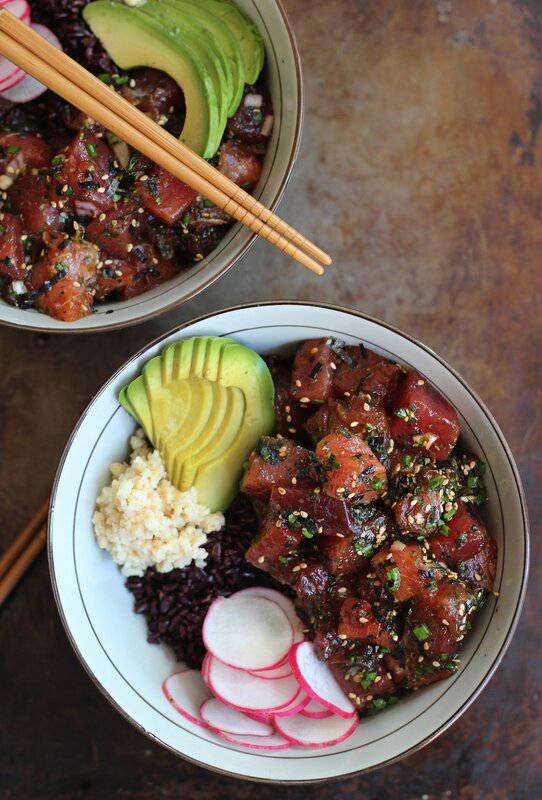 And if you have access to fresh, sushi grade fish like salmon or bluefin ahi tuna, whipping up your own batch of poke is a no brainer. I personally love enjoying it over black rice and with a heaping teaspoon of chopped macadamia nuts. And of course, serving it without avocado is a practically a sin. 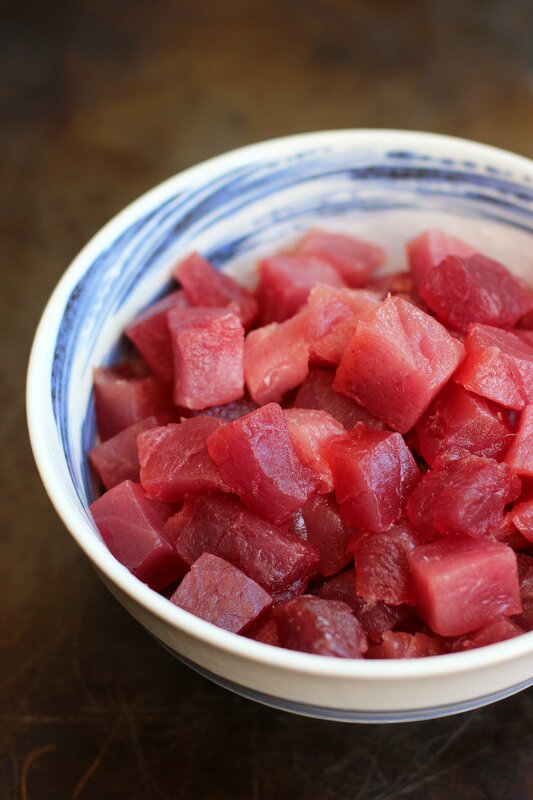 Pat the fresh ahi dry and cut into 1/2 cubes. Set aside in a medium bowl. Whisk tamari, sesame oil and sugar together into a small bowl. Add wasabi if you like a bit of heat. 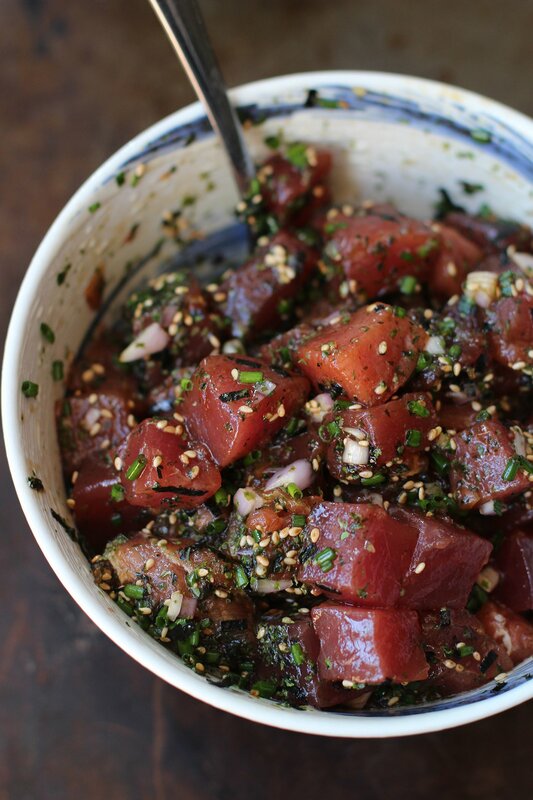 Pour marinade over the ahi and mix. You can keep the ahi marinated for a couple of hours until you are ready to serve. 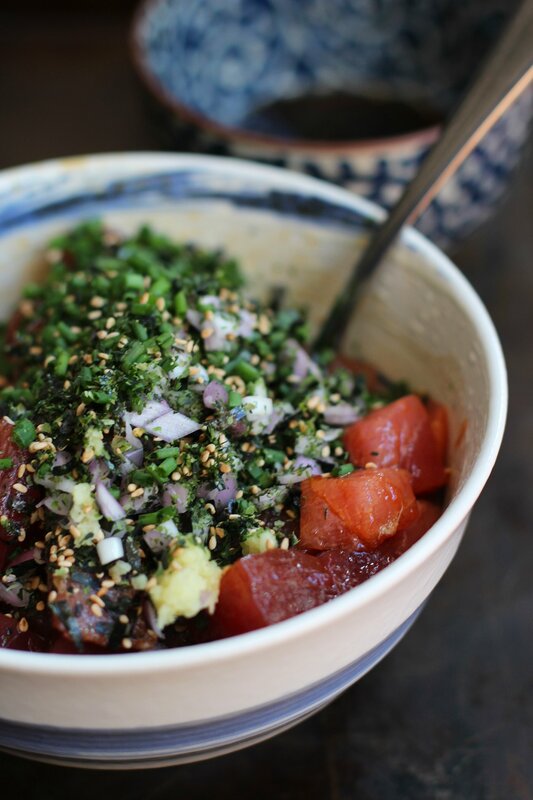 When ready to serve, mix in the furikake, shallots, chives and ginger into the marinated ahi. Top bowls of rice with a heaping pile of ahi, radishes, plenty of avocado and a scoop of chopped nuts. Pregnant with #2 and #3 and I still made this last night. I enjoyed every morsel. It was divine! @Jane, there is Nijiya Market in Japantown and Tokyo Fish Market in Berkeley. Both will have a variety of sashimi grade fish. Avocado makes everything better!! Wonderful! I’m obsessed with poke. I spent a couple years in Hawaii as a kid and it kind of became a staple. I’ve never made it since, though. I’m definitely going to try this recipe. Thanks! 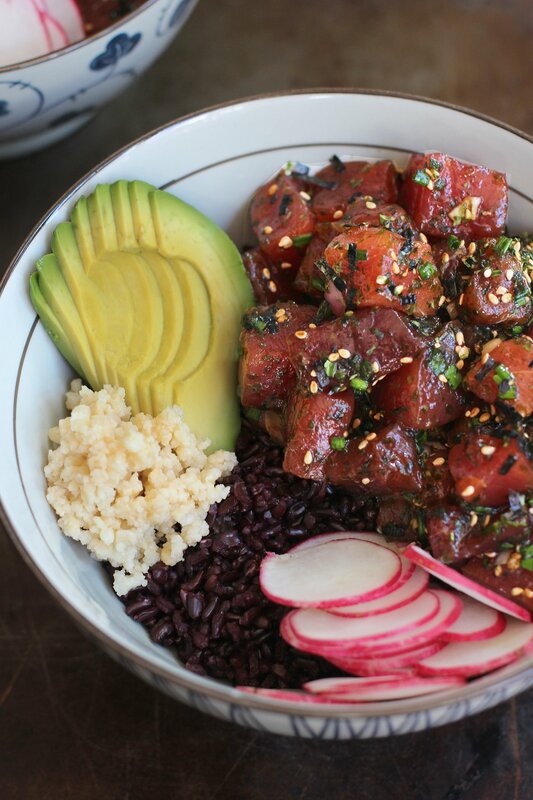 Poke Bowl recipes: Making the latest food trend family-friendly.